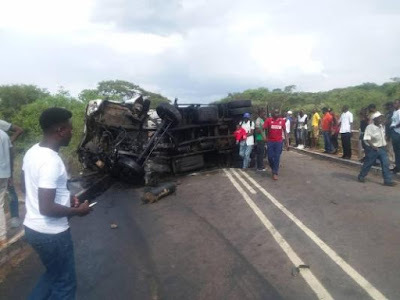 Three people died while two others were injured when a Toyota Allion they were travelling in was involved in a head-on collision with a truck at Mupfure Bridge 10 kms from Chegutu along the Harare- Bulawayo highway this afternoon. The three died when the Toyota Allion plunged into Mupfure River after the driver lost control of it. Police spokesperson Assistant Commissioner Paul Nyathi said the Toyota Allion was trying to overtake at the bridge before the driver decided to return to the left lane to avoid a head-on collision with an oncoming haulage truck, and in so doing lost control of the vehicle. Three victims of the mishap died on the spot while the two injured and were taken to Chegutu District Hospital. The haulage truck which was driving towards Harare is reported to have swerved and faced the opposite direction as its driver tried to avoid a head-on collision with the Toyota Allion.